This title is not meant to be glib. Many millions of people tuned in after the Super Bowl to watch as the beloved Pearson family was torn apart by flames. We LOVE the Pearsons. They are perfectly imperfect, and we see glimpses of ourselves in the scenes reflected on our TV screens. So, when the Pearson’s home was destroyed and their lives torn apart, we were deeply affected. Earlier this week, I got a glimpse of some very real lives — in fact, an entire community — that have been torn apart by a very real disaster. 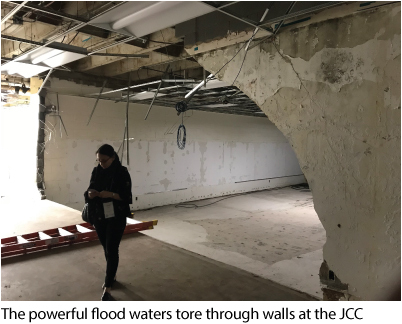 I traveled to Houston with other Federation professionals and lay leaders to see first-hand the unimaginable destruction to the Jewish community caused by Hurricane Harvey and the incredible impact our UJA Campaign dollars have had in providing relief. We learned how they are rebuilding and how much more is needed to get them back on track. I was deeply affected. Typically, when I think of Federation acting to save lives and rebuild in emergency situations, what I envision is far away — rockets and fires in Israel, the earthquake in Haiti, or the war in the Ukraine. But the people of Houston look and sound (despite the accent) just like me. They have mortgages. They send their children to the JCC preschool. They choose between excellent public schools and fantastic Jewish Day Schools. They have good jobs and plan for retirement. They send their children to college, and many of those children move back to Houston because life, and more importantly, Jewish life, is REALLY good there. They are us. On August 27, in a matter of hours, the fabric that holds this thriving Jewish community together became waterlogged and shredded into pieces. More than 2,000 families who live within a two-mile radius of one another lost everything. As the flood waters quickly rose, they elevated what they could, grabbed what they could carry, and evacuated. Once the water receded, they returned to their homes to find everything destroyed. Everything. Flood insurance pays a maximum of $250,000. If you lost everything, but still had to pay your mortgage and then rent on top of that, how far would $250,000 go? Would you rebuild? If so, would you pay an additional $200,000 to raise your house six feet? After all, this was the third flood event in five years and surely won’t be the last. Would you sell your property for just the value of the land (because that’s all it’s worth), take the loss, and move – away from your neighborhood, your schools, your synagogue, and your family and friends? Would you still be able to afford summer camp, Day School tuition, and JCC and synagogue membership, given your unexpected financial hardship? Now consider that it wasn’t just homes that were lost. Synagogues, schools, the JCC, and the Jewish nursing home all sustained significant damage. Would you have the bandwidth, financially and emotionally, to rebuild your community as well as your life? Fortunately, the Jewish community of Houston is not facing this colossal challenge alone. 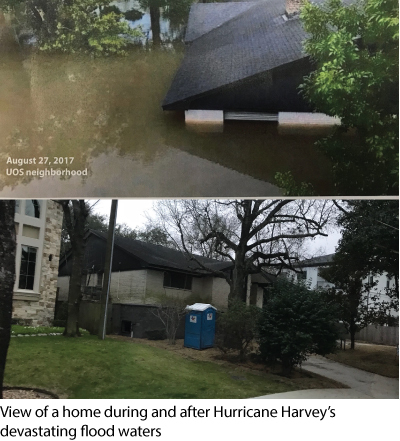 When Hurricane Harvey hit, Jewish Federation of Greater MetroWest NJ along with Federations across North America and even the government of Israel sprang into action in partnership with The Jewish Federation of Greater Houston and raised $20 million in disaster relief. Every person who worked for a Jewish institution that sustained damage immediately received a check for $1,000, enabling them to buy groceries and other necessities to get them through the first few days. Support was also provided to day school families, synagogue members and others connected to Jewish life. All families were able to come to the JCC to get supplies and were informed about the services of Jewish Family Service to provide financial support, counseling and guidance to navigate post flooding. With support from Federation, a nearby Jewish overnight camp provided children a safe place to stay, with trauma counseling and programming, while parents dealt with the damage to their homes. The Jewish institutions received capitol grants to begin rebuilding. The gifts you make each year to our UJA Annual Campaign have made this support possible. It’s five months later, and we see signs of revitalization. But Houston’s Jewish community still needs help. Families remain in crisis. 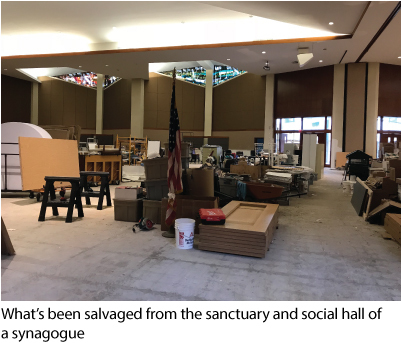 The Jewish Federation of Greater Houston, their partner agencies, and area synagogues must make difficult decisions on how to reweave the fabric of their community, not just to recreate what they had, but to make it stronger. They estimate a need of an additional $50 million to rebuild. We will do whatever we can to help, because that’s what community is all about. This Is Us.